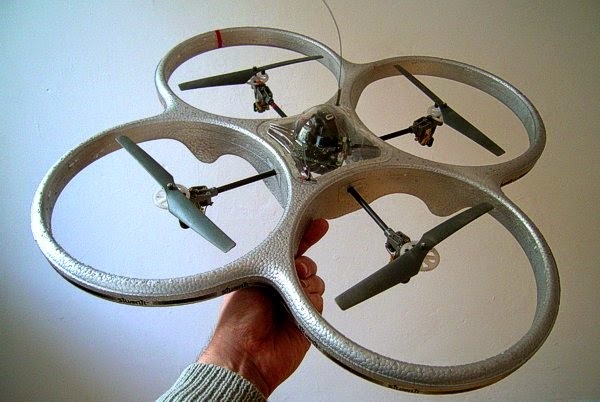 It's been about 10 years since the configuration of the model Quadcopter appeared. In fact the full-size configuration goes back almost to the dawn of manned flight. 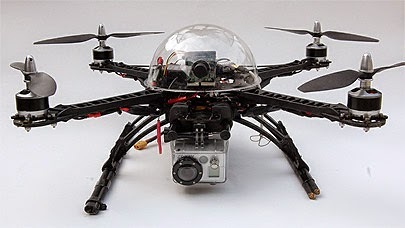 But it is only in recent years that the Quadcopter has found its place in the world of aviation. The Quadcopter can take off and land vertically and hover, like a helicopter. So, you might well ask, why not just have a helicopter? The Quadcopter is much simpler mechanically than a helicopter. Lift and manoeuvring are both achieved by altering the speed of the four electric motors. Normal, fixed pitch propellors are used. A conventionally helicopter needs much more complicated mechanical rotor systems to achieve the same thing. This 2005 model had a mechanical gyroscope. The launch procedure called for setting the model on level ground, switching on and giving the gyroscope time to run up to speed before attempting to fly. By varying the speed to the four separate motors the gyro would keep the model level. There were magnetic sensors on the gyro gimbals and an electronic card that mixed together the intentional pilot demands (from the transmitter) with errors of position from the gyro. The mechanical gyro proved rather vulnerable and was usually the first thing to break. But without gyro stabilisation flying a Quad is a bit like balancing a pencil on end on the end of your finger, it can be done but it takes a lot of effort. But soon solid state sensors came along that were much more robust. With the configuration rediscovered and the new electronic control systems Quads got bigger and with larger sizes came new possibilities. The new Quads could carry cameras. And, around that time, model electronics moved from just stability to providing the ability to totally fly the model. Small GPS based systems meant the model position could be known accurately. It became possible to make the model fly itself along a predetermined route, take pictures and return. Now Quads like the one shown below are virtually fully functional drones. They can be flown remotely from the ground, or flown with a pilot on the ground viewing the world through an onboard camera. Or even flown autonomously, following a predetermined flight path set up before launch. Another feature is, Follow Me. Here the operator has a GPS equipped device, smartphone etc, which stays in contact with the Quad. The Quad monitors the operators GPS position and flies along after the operator and can take a video. The desire to have 'selfie' videos of oneself performing some strenuous outdoor activity seems to have driven this one. Finally, if the Quadcopter configuration is so good why not replace the man carrying helicopter? Unlike the conventional helicopter the Quad has no redundancy in case of an engine failure. Helicopters can autorotate in the case of engine failure. But electric power systems are very reliable and by doubling up the number of motors and propellors redundancy can be added. It's only a matter of time before the man carrying Quad takes off.